You can have the cake but the bird seed is MINE. When’s Bird Day? Maybe you will get a bowl to put it in. Every day is dog day. We don’t need a reason to celebrate. They are celebrated all of the time. Kismet needs a National Bird Day. Since I’m top dog at this house, pretty much every day is Dog Day! It’s my Peep, she can’t help herself, she makes sure I am always happy and treats me like a King. I am lucky she gave me such a wonderful, loving home! Happy Dog Day to all the doggies of the world! We hear ya. We have it pretty good ourselves. Oh Boy! Every DOG must have his/her Day! Like everydoggy already said, EVERY DAY is OUR Day, ‘cuz we’re SPECIAL! 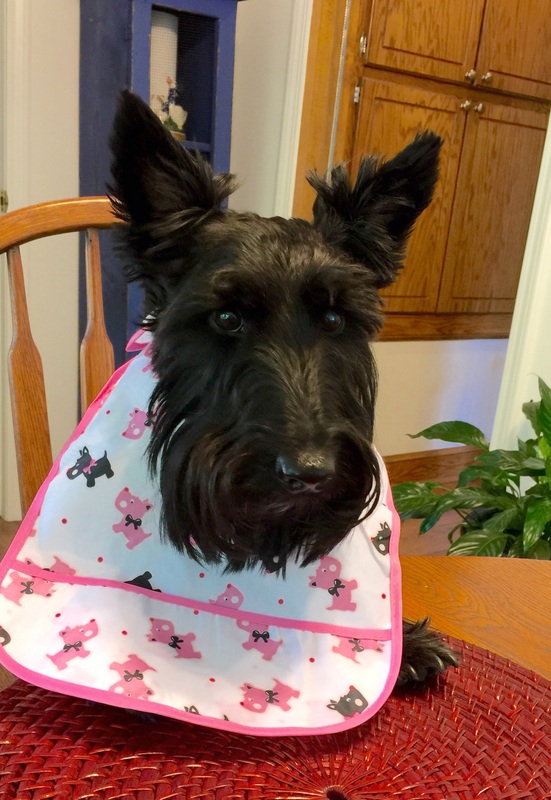 Oh Lucy, you are just too, TOO cute in your Pink little girl bib! Gosh you are just Adorable and since it is a Shpecial Day we want’s to KISS you! Mwa! Kissy, Kissy! You and Indy are too adorable and mum is getting the swoons over your picture again! I think your blog is dangerous to her health, but hey, dat never seems to stop her from waiting with anticipation to see you 2 every day in all of your cuteness! Kissies, and HAPPY DOG DAY TO YOU! Happy Dog Day to you, too! I llove your cute bib, you look adorable wearing it! Enjoy your day! You said a woof full Lucy. Happy National Dog Day to you too. Happy Dog Day, Lucy!! You definitely look like you could take care of the cake, and all of the cake at that! The life & adventures of two Scottie brothers. He's Storm. He's a dog. How difficult do you want to make it?